It's difficult to write a review for a new entry in a long-running puzzle series because at some point, everyone's already said everything there is to say. ...what? I can't just do that? I need to find something else to say about it? OK, fine. Fine! We've had these Mario vs. Donkey Kong games for 11 years now. 11! A fair point to make is that two of the games in this series (which there have been six) are nothing like the rest. The first was an actual platformer and the title before this one was a 3D game similar to Pipe Dreams. Tipping Stars goes back to the series' most well-utilized style: a side-scrolling puzzle game starring adorable wind-up versions of classic Mario characters through levels that require paying attention to multiple moving parts and use the touch screen to manipulate obstacles and paths to direct the little guys where you need them to go. This is still a winning formula, really, even if Nintendo's gone back to the well on it a couple of times. Every level is quite hectic, especially when they get larger and require constant scrolling back and forth. As more timing-oriented things like Thwomps are introduced, you also have to think a lot more about the timing of when the minis go by, spacing them out enough to avoid being smashed. If one mini is destroyed, the game is over. Mario vs. Donkey Kong seems like one of those franchises Nintendo's going to drop on every console they release. They build a game, offer a suite of creation tools and wipe their hands, satisfied in the knowledge that the community will take over and extend the game's life with user-made content. Refresh on every system, offer a bunch of new designer levels, and they've got a cheap, fun puzzle game people can keep enjoying. I'm actually surprised they don't make it a shell that has add-on levels you can buy and a free-to-play sort of model. If they do that in the future, don't blame me. When it comes down to a game like this, there are two questions to ask: does it offer any new ideas and is it broken? It's certainly not the latter, everything plays fine and while there are a couple of issues with buttons being too small on the touch screen, I didn't run into any issues outside of that. The newest idea is the way levels are built and shared through the eponymous star tipping mechanic. Stars are earned based on how well you complete a level and can be used to buy creation tools. Levels are shared to the Miiverse and can be liked with Yeahs. You can even tip content creators in stars, giving them in-game currency for making levels so they can have more money to buy more tools. The best designers can make more varied levels which ties the depth of customization with someone's design skills. Levels can be replayed to earn more stars and there are a bunch in the Miiverse that exist purely to award the highest amount of stars. On the 3DS, levels can be set as StreetPass items and will transfer to whomever you cross paths with. That's a cool idea! It's like highlighting your favorites for anyone that passes by. Unfortunately, I wasn't really able to see what the Wii U version was like because the cross-buy option didn't work. I don't know if it was something with how I downloaded the game, an issue with my account, or that my copy was from a review code. This is Nintendo's first cross-buy game and the system doesn't seem to work super well. I expected to buy and link the game to my account, hop onto my other system and get a "Well, hello! You bought this on another system so here it is!" message. Instead, I received a download code on my receipt for the other version. That really doesn't make much sense. My account is linked across both systems and I could view the receipt from one to the other, so why can't it just give me the other version? 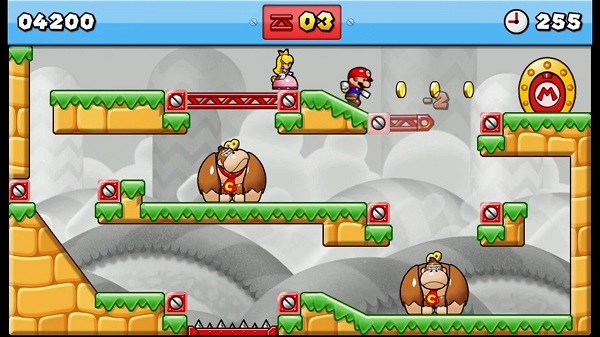 Mario vs. Donkey Kong: Tipping Stars is a good new game in the series. Nothing more, nothing less. The gameplay really hasn't introduced much new but the Miiverse level sharing functionality hopefully will give it more legs. The ability to own both the 3DS and the WiiU versions of the game with a single purchase is nice, at least. You have nothing to lose if you want to try Stretchmo, so go ahead and download it! Odds are you'll fall in love with it like I have with all of these games, and this latest entry is still a ton of fun to get into and tear apart. Play it, buy some levels, and achieve puzzle platforming bliss on the go. Characters aside, Mario and Donkey Kong: Minis on the Move is a very fun game, with a frantic pace and several deviations on the main puzzle type that serve to give you a pretty full package. Being able to expand the longevity of this game by allowing level downloads is also a plus, and with a good community, it can last for a very long time. And I certainly hope it does last for a while, because this is a game that would be great to come back and revisit with all the levels and creativity a good community usually brings to a title. The best way I could recommend Kersploosh! would be to have a friend or two with a 3DS agree to buy the game as well. Turn on StreetPass, so every time you see each other after playing, you’re updating your scores and challenging each other indirectly. It’s something you’ll want to do, as well, even if it's a little bit of an unrealistic thing to ask in order to make this game fun. Kersploosh! is a fun, if brief, game. It still feels good, and some of the puzzles are real mindbenders, and even though there's a bit too much similarity between it and the first game, it's impossible to go wrong with a $5 asking price for something so fun.